Spectacular, isolated mountain property, yet within short driving distance from both Highways 89 and 36. The view of both the valley below and the mountains to the west can't be beat. With 20 acres to choose from, you can park your RV most anywhere along the gradually sloped top of the ridge or build your home or cabin into the hillside. Furnished - Great Views! Decks on Main & Upper levels.Electric panel heaters. Nice storage shed - upstairs family room with vaulted ceiling - exposed beams - wood stove. Made for great entertaining. 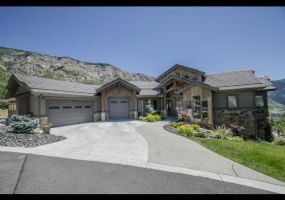 This 2015 Parade of Homes will have you in awe from the minute you drive in the driveway. Gorgeous landscape and Views in every direction surround this custom designed home. The Exterior boasts full set stone, aggregated rusted steel and concrete siding. Bartile roof and custom rain gutters finish the breathtaking exterior. Rio de Sion is the only new subdivision offering finished residential lots for sale in Virgin, Utah, the gateway city to Zion National Park. There are 9 finished residential lots in phase one and 47 papered lots in phase two and three. Phase one, two and three are all recorded and have been assigned parcel numbers. Several homes are complete and occupied. 7.42 acres w/ views in Broken Spur Ranch FOR AS LOW AS $283 A MONTH using our seller financing! Own a mini farm/ranchette nestled up against the Antelope Mountain Range in beautiful Southern Utah. Each lot comes with water rights & power lines along one side. Large alfalfa farms nearby ensure farm roads are well maintained & creates a green rural farm setting. 5 acres w/ views in Broken Spur Ranch FOR AS LOW AS $212 A MONTH using our seller financing! Own a mini farm/ranchette nestled up against the Antelope Mountain Range in beautiful Southern Utah. This corner lot comes with water rights & power lines along one side. Large alfalfa farms nearby ensure farm roads are well maintained & creates a green rural farm setting. Directions: Cedar City, HWY 56 West to NewCastle; R on Main (gas station); R 1.32 mi on 1200N, immediately L on 50 E. Then .75 mi R on 1800, then left on 400 E in 1.32 mi turn R on 2800 N. follow map to lot. 5 acres w/ views in Broken Spur Ranch FOR AS LOW AS $212 A MONTH using our seller financing! Own a mini farm/ranchette nestled up against the Antelope Mountain Range in beautiful Southern Utah. Each lot comes with water rights & power lines along one side. Large alfalfa farms nearby ensure farm roads are well maintained & creates a green rural farm setting.